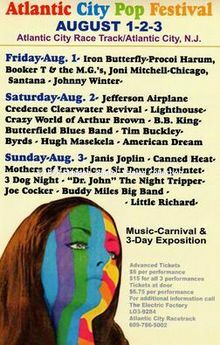 The Atlantic City Pop Festival of 1969. The penultimate festival. This is 1969’s 24th festival, the first occurring back in May with the Aquarian Family Festival. On my list of festivals for that summer, Atlantic City’s is the last before THE Woodstock Music and Art Fair in mid-August. Herb, Allen and Jerry Spivak, Shelley Kaplan and Larry Magid produced the event and not unlike Woodstock Ventures, they envisioned an event that featured top-flight entertainment along with about 70 craft and food booths in a relaxed, outdoor atmosphere. There are not many criticisms about the Woodstock line-up. The typical statement both from those who were there and those not is that it was the greatest line-up ever. Of course, that’s not true. And greatness is in the ear of the listener. For all the great acts that appeared at Woodstock, it did not have the mix that the Atlantic City Pop Festival had. The reason a few band’s names are crossed out is that although scheduled, they did not appear. Crosby, Stills, and Nash because of Nash’s illness; Johnny Winter because his equipment didn’t arrive on time; and though Joni Mitchell did sing a few songs, the audience was not as receptive as she wanted and she walked off. Biff Rose, the festival’s MC, filled in and so became part of the list. Joni was certainly not going to compose an ode to Atlantic City after that experience! Notice the names like Buddy Rich, the Mothers of Invention, BB King, Hugh Masekela, and Procol Harum. Great choices and there were no equivalents at Woodstock. The differences between the two events are even fewer than the differences between it and other similar festivals that summer. Most had great line ups. Most were multiple days. And AC was in the NY media’s circle of coverage: a great advantage that Woodstock also had. The Atlantic City Pop Festival was in a race-track. No camping as at Woodstock, thus much less an opportunity for attendee to bond and become part of a whole weekend. Estimates are about 100,000 people attended each day. A great number, but far less than the “astronomic” half-million in Bethel. Finally, like nearly ever other festival that summer, there is no audio or visual record of the event. Over the years, various people have written their impressions, but the organizers did not do more that create a great weekend. Woodstock Ventures did not set out to create a legacy by filming and recording their event, but in my opinion, their festival would simply be another one on that summer’s long list of festivals had they not done those things. My lasting AC Pop memories/impressions: They utilized a double-sided rotating stage that enabled one act to be setting up behind unseen while the other was performing, thus minimizing any between-performance delays. This generally worked very well, with the exception of Jefferson Airplane, who asked for patience as they were experiencing difficulties/delays setting up their light show. Creedence Clearwater Revival gave a tight, no-nonsense (stage banter-less), intense performance that John Fogarty interrupted early on to demand that all strobe lights be turned off. 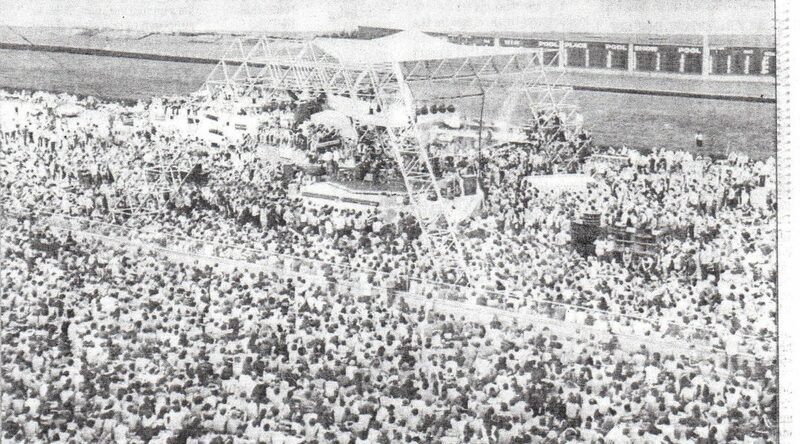 CCR got the best crowd response of the three days up until Little Richard’s festival-ending performance. At the time still very much at the top of his rockin’ game, Richard threw his gold lame (or was it white?) cape into the crowd and performed Larry Williams’ “Bony Maroney” as the sole song in each of his two encores (making a total of three times he performed that song!). Frank Zappa & The Mothers of Invention did a jazzy, all-instrumental, no-vocals set, at the conclusion of which Zappa commented, with tongue-in-cheek, that “we’re gonna get off now & make way for the ‘heavier’ acts.” (Janis Joplin was on next!). The Chambers Brothers closed one night with a masterful, gospel-tinged version of “People Get Ready” that seemed poignant & entirely appropriate. Canned Heat frontman Bob Hite moaned that their lead guitarist had just quit & asked for requests at the outset of an informal, boogie-driven performance. Procol Harum guitarist Robin Trower showed his blues chops when he was featured on a song or two. Iron Butterfly seemed oddly out of place & a lot of their sound seemed to me to be coming from canned sources, not their instruments. ( We got into a near fist fight in a diner after the festival over who was better, CCR or Iron Butterfly!) We slept in the parking lot next to our car on/under tarps/ blankets & one night in the pouring rain we ran around with a group of soaked people, as we chanted “join us, good people!” We each purchased three bottles of Ripple wine, to be consumed one a day. Our food was primarily cold canned spaghetti & baked beans and snack food. We also purchased hamburgers, cola, & other racetrack concessions. When we got home, we kicked around the idea of going to Woodstock, but one of our group insisted that it looked to be a total mess to be avoided. We listened, unfortunately. WOW! Thank you for sharing. Great stuff. I had just turned 16. I remember a lot of it. I was real close to the stage when Janis kissed some guy & I was jealous. I came from the Gloucester/Camden area.